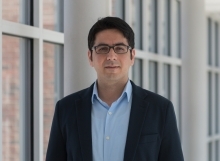 Assistant Professor Soheil Feizi’s “Network Maximal Correlation” has been given the IEEE Transactions on Network Science and Engineering (TNSE) Best Paper Award for 2019. This work (named the best for over a three-year period) introduces a new statistic for measuring dependency in multivariate random variables, as well as introducing a computational framework to evaluate it given multivariate data sets. The goal of the new measure is to automatically identify complex, non-linear dependencies that would not be observed with traditional measures of correlation.